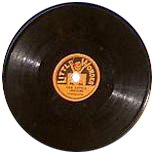 Little Wonder Records were single-sided five inch discs, the same size as a modern CD, but containing just a single song, running for little more than a minute. The label was the brainchild of former Columbia Records Executive, Henry Waterson. It gave ordinary Americans their first affordable access to recorded sound. Securing a Woolworth endorsement proved lucrative for Waterson, with sales topping half a million records a week! Henry Waterson's Little Wonders were sold at Woolworth's in North America and other 5 &10¢ Stores. The 10¢ discs were single-sided and played at 80 rpm, giing one minute's sound. The grooves had to be tightly packed to fit on the tiny records, meaning the sound quality was modest. They were sold without sleeves to keep the price low, and introduced ordinary people to recorded sound for the first time. The era's big name labels, including Columbia, Victor and Edison sold ten or twelve inch records for around one dollar each, which had kept them outside the price-bracket of most households. That all changed with Little Wonder. The records have a special link with Woolworth's; many were recorded in Columbia's studios at the foot of the Woolworth Building in New York. Please listen and enjoy. Little Wonder 846: Ten Little Indians (Vocal Quartet). For a great website about Little Wonder Records please take a look at littlewonderrecords.com.